Detects anomalies in your data stream. A record is an anomaly if it is distant from other records. To detect anomalies in individual record columns, see RANDOM_CUT_FOREST_WITH_EXPLANATION. The RANDOM_CUT_FOREST function's ability to detect anomalies is application-dependent. To cast your business problem so that it can be solved with this function requires domain expertise. For example, determining which combination of columns in your input stream to pass to the function and potentially normalize the data. For more information, see inputStream. A stream record can have non-numeric columns, but the function uses only numeric columns to assign an anomaly score. A record can have one or more numeric columns. The algorithm uses all of the numeric data in computing an anomaly score. If a record has n numeric columns, the underlying algorithm assumes each record is a point in n-dimensional space. A point in n-dimensional space that is distant from other points receives a higher anomaly score. The algorithm starts developing the machine learning model using current records in the stream when you start the application. The algorithm does not use older records in the stream for machine learning, nor does it use statistics from previous executions of the application. The algorithm accepts the DOUBLE, INTEGER, FLOAT, TINYINT, SMALLINT, REAL, and BIGINT data types. DECIMAL is not a supported type. Use DOUBLE instead. The following is an example of anomaly detection. The diagram shows three clusters and a few anomalies randomly interjected. The red squares show the records that received the highest anomaly score according to the RANDOM_CUT_FOREST function. The blue diamonds represent the remaining records. Note how the highest scoring records tend to be outside the clusters. For a sample application with step-by-step instructions, see Detect Anomalies. The following sections describe the parameters. Pointer to your input stream. You set a pointer using the CURSOR function. For example, the following statements sets a pointer to InputStream. -– Perhaps normalize the column X value. –- Combine columns before passing to the function. When using this function, your input stream can have up to 30 numeric columns. Using this parameter, you specify the number of random cut trees in the forest. By default, the algorithm constructs a number of trees, each constructed using a given number of sample records (see subSampleSize later in this list) from the input stream. The algorithm uses each tree to assign an anomaly score. The average of all these scores is the final anomaly score. The default value for numberOfTrees is 100. You can set this value between 1 and 1,000 (inclusive). By increasing the number of trees in the forest, you can get a better estimate of the anomaly score, but this also increases the running time. Using this parameter, you can specify the size of the random sample that you want the algorithm to use when constructing each tree. Each tree in the forest is constructed with a (different) random sample of records. The algorithm uses each tree to assign an anomaly score. When the sample reaches subSampleSize records, records are removed randomly, with older records having a higher probability of removal than newer records. The default value for subSampleSize is 256. You can set this value between 10 and 1,000 (inclusive). Note that the subSampleSize must be less than the timeDecay parameter (which is set to 100,000 by default). Increasing the sample size provides each tree a larger view of the data, but also increases the running time. The algorithm returns zero for the first subSampleSize records while the machine learning model is trained. The timeDecay parameter allows you to specify how much of the recent past to consider when computing an anomaly score. This is because data streams naturally evolve over time. For example, an eCommerce website’s revenue may continuously increase, or global temperatures may rise over time. In such situations, we want an anomaly to be flagged relative to recent data, as opposed to data from the distant past. The default value is 100,000 records (or 100,000 shingles if shingling is used, as described in the following section). You can set this value between 1 and the maximum integer (that is, 2147483647). The algorithm exponentially decays the importance of older data. Uses only the most recent 100,000 records in the calculations (and ignores older records). Within the most recent 100,000 records, assigns exponentially more weight to recent records and less to older records in anomaly detection calculations. If you don't want to use the default value, you can calculate the number of records to use in the algorithm. To do this, multiply the number of expected records per day by the number of days you want the algorithm to consider. For example, if you expect 1,000 records per day, and you want to analyze 7 days of records, set this parameter to 7,000 (1,000 * 7). The timeDecay parameter determines the maximum quantity of recent records kept in the working set of the anomaly detection algorithm. Smaller timeDecay values are desirable if the data is changing rapidly. The best timeDecay value is application-dependent. The explanation given here is for a one-dimensional stream (that is, a stream with one numeric column), but it can also be used for multi-dimensional streams. A shingle is a consecutive sequence of the most recent records. For example, a shingleSize of 10 at time t corresponds to a vector of the last 10 records received up to and including time t. The algorithm treats this sequence as a vector over the last shingleSize number of records. If data is arriving uniformly in time, a shingle of size 10 at time t corresponds to the data received at time t-9, t-8,…,t. At time t+1, the shingle slides over one unit and consists of data from time t-8,t-7, …, t, t+1. These shingled records gathered over time correspond to a collection of 10-dimensional vectors over which the anomaly detection algorithm runs. The intuition is that a shingle captures the shape of the recent past. Your data may have a typical shape. For example, if your data is collected hourly, a shingle of size 24 may capture the daily rhythm of your data. The default shingleSize is one record (because shingle size is data dependent). You can set this value between 1 and 30 (inclusive). If you set the shingleSize too small, the algorithm will be more susceptible to minor fluctuations in the data, leading to high-anomaly scores for records that are not anomalous. If you set the shingleSize too large, it may take more time to detect anomalous records because there are more records in the shingle that are not anomalous. It may also take more time to determine that the anomaly has ended. Identifying the right shingle size is application-dependent. Experiment with different shingle sizes to ascertain the effect. The following example illustrates how you can catch anomalies when you monitor the records with the highest anomaly score. 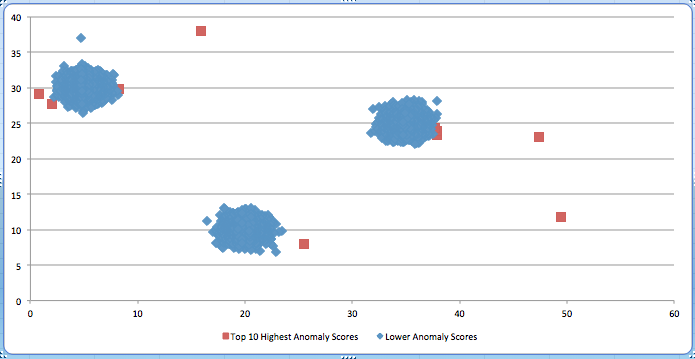 In this particular example, the two highest anomaly scores also signal the beginning and end of an artificially injected anomaly. Consider this stylized one-dimensional stream represented as a sine wave, intended to capture a circadian rhythm. This curve illustrates the typical number of orders that an eCommerce site receives per hour, the number of users logged into a server, the number of ad clicks received per hour, etc. A severe dip of 20 consecutive records is artificially injected in the middle of the plot. We ran the RANDOM_CUT_FOREST function with a shingle size of four records. The result is shown below. The red line shows the anomaly score. Note that the beginning and the end of the anomaly received high scores. When you use this function, we recommend that you investigate the highest scoring points as potential anomalies. The trends that machine learning functions use to determine analysis scores are infrequently reset when the Kinesis Data Analytics service performs service maintenance. You might unexpectedly see analysis scores of 0 after service maintenance occurs. We recommend you set up filters or other mechanisms to treat these values appropriately as they occur. For more information, see the Robust Random Cut Forest Based Anomaly Detection On Streams white paper at the Journal of Machine Learning Research website.